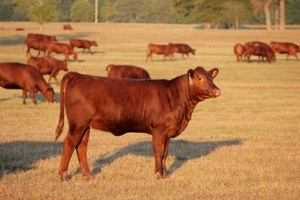 Esquire Grows Champion Red Poll Cattle on Grass. Always Have, Always Will! 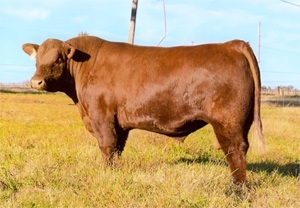 What type of champion Red Poll do you need? Esquire Cattle has been a pioneer in the Red Poll cattle industry for over three decades and we're now proud to offer select young bulls for sale, 100 cows for sale and quality heifers for sale. Remember, you are what you eat. All Esquire Red Poll cattle is grass fed, including cows and calves. Not only for the health benefits, but grass fed leads to a better feed conversion rate, as two pounds of grass equals ¾ pound of meat. Owner Phil Wyrick has raised cattle all his life. Wyrick began at nine years old, with a single 1/2 blood Red Poll heifer, which he raised on a bottle. It was a true calling and shortly there after Wyrick started a family manufacturing business with his father and two brothers in pursuit of the American Dream. Fast forward to the present, where Wyrick has taken his family values, hard work ethic and experience into creating the best ranches in Arkansas that proudly serve the whole U.S. and North America. Esquire Cattle is a family business, which has always been a top priority for owner Phil Wyrick. He and his wife BJ (Brenda) Wyrick have been married for 38 years and have raised two daughters. The local community is also extremely important to the Wyrick family. In addition to being a cattle rancher and running a manufacturing business, Phil has also served three terms in the Arkansas House of Representatives and one term in the Arkansas Senate. Phil served as the Director of the State Department of Livestock and Poultry under Governor Mike Huckabee. He is now concentrating on the cattle ranching business and wants to talk to you about your business needs.